President Mnangagwa has slammed the rent-seeking behaviour by some businesses that continue to increase prices of basic goods without justification, saying they were exploiting the people and hampering the attainment of Vision 2030. Addressing the Zanu-PF National Youth Assembly in Harare yesterday, the President said a meeting between Government and various stakeholders was on the cards to find common ground. “Government notes the present wanton, upsurge and ever escalating unjustified increase in prices,” President Mnangagwa said. 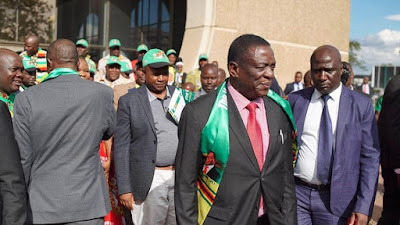 President Mnangagwa, who is the Zanu-PF First Secretary, said servant leadership would be the flagship of the Second Republic as Government focuses on attaining Vision 2030 which entails turning Zimbabwe into an upper middle income. “Over the past year, I have cherished every moment of service, by all of use guided by our commitment to servant leadership,” he said. “Even in crises and hard times, there really is no greater honour than to serve the people of Zimbabwe. No matter how you choose to serve or what you choose to do, you must always remember our core value system. He said small to medium enterprises (SMEs) played a critical role in economic growth and Government hoped to see a large number of young people presenting viable small to medium sized project proposals and seek support for start-ups. “As the National Youth Assembly and leaders from various provinces, you have the obligation to skilfully mobilise the youths to form the critical mass needed to rebuild and grow every sector of our economy,” the President said. “I challenge you to accelerate the development of sustainable youth-owned businesses. It is through the full participation of young people that we will speedily modernise, industrialise and grow our economy. “The establishment of the Empowerment Bank among other initiatives is testimony of my Government’s continued commitment to improve the quality of life and opportunities for our youth. Youths, President Mnangagwa said, should also start-up businesses which sprout from information communication technology, mining to agriculture. “There are vast opportunities that the Second Republic will continue to avail to the youth,” he said. Turning to politics, President Mnangagwa said he was aware of machinations by enemies to destabilise the party by causing despondency and disunity amongst leaders. “Let us all condemn and expose these acts,” he said.